Ed Miliband and Ed Balls are announcing some preliminary Labour economic policies today, and one of the headlines is a reduction in VAT on petrol, from 20% back to the 17.5% level it was set at prior to January this year. The main argument is that as petrol prices rise so this is hitting car drivers (read “middle England”). 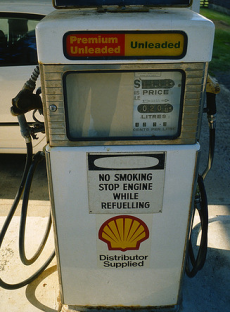 So what should Balls and Miliband say on fuel? The solution is to set a flat rate tax on a litre of fuel, i.e. the same amount of cash goes to the exchequer, regardless of the price of oil. At the moment every litre of fuel is subject to the Hydrocarbon oil duty, currently £0.5895/litre, and VAT at 20%. This means that as the price of petrol goes up, so the amount of money the government makes from VAT on fuel also goes up, i.e. the motorist is hit twice. If price increases at the pump were only determined by rises in the price of crude it would be presentationally easier, not looking like the government is deliberately hitting the motorist, and also avoiding Labour advocating a VAT cut on fuel that symbolically looks anti-green. Making the rate of the Hydrocarbon Oil Duty rise and fall relative to the fuel price would be the ‘fuel price stabiliser’ intimated in the Conservative Party manifesto. 1. It increases fiscal instability as the government will find it considerably more difficult to predict what the revenue will be from fuel taxation, since revenues will vary more than they do at present. 2. The government would in effect have to decide what is the ‘fair’ price of fuel. It will require governments to tell the difference between ‘permanent’ or trend increases in oil prices driven by the fundamentals of supply and demand and ‘temporary’ spikes and troughs that it must smooth out by corrective changes to tax rates. This is very difficult thing to do – anyone that can do it accurately can go to the City and make a lot of money as an oil trader. In respect of your proposal, it is important to remember that fuel duty is already a flat rate per litre, as you suggest it should be. Taxes make up 63% of the price of petrol and 46% of the price from the duty and just 17% from the VAT). So a large majority of the tax on fuel is already in the form of “a flat rate tax on a litre of fuel”, as you propose. Farmers and fishermen already get their fuel almost tax free, and it seems the biggest competitiveness problem associated with rising fuel prices in the UK is for hauliers who face competition from continental haulage companies who come to the UK with very large tanks of fuel bought more cheaply on the continent. For ordinary people driving cars, the solution is to drive less. A high fuel price is the most effective policy we have to encourage this kind of behavioural change. And never forget that most people on low incomes don’t own cars. Thanks for the additional points. Your last line brings this right back to the point of the blog entry in the first place – I agree that high fuel prices are a good thing, and that’s why I’m annoyed Labour is – admittedly mostly symbolically – proposing the opposite. @Jack – couldn’t the Hydrocarbon Oil Duty be amended to be in inverse proportion to the fuel price? That plus VAT would then have the same effect? Although I can see the tactical, opportunistic advantage of an attack, I can’t help agreeing that it doesn’t exactly scream “long-term strategy”. It’s also, as Dizzy somewhat unhelpfully points out, diametrically opposed to what EM said as Environment Secretary, which doesn’t help the credibility of the position. A flat tax makes some sense but reducing VAT on fuel to zero would require the EU to rewrite the VAT directive. VAT is an ad valorem tax, not a specific duty. I doubt a derogation would be granted to make such a large blanket exemption from VAT.